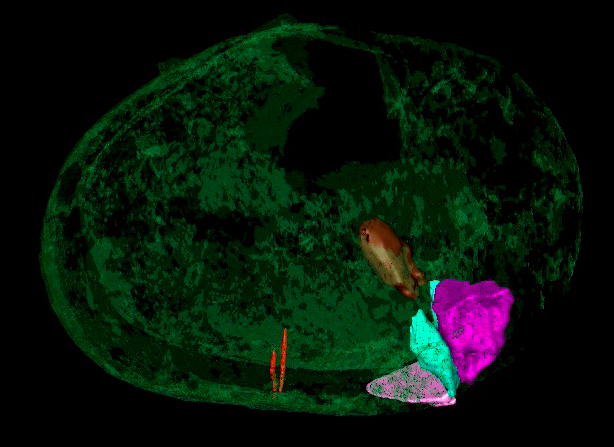 We develop the UCSF Chimera visualization program which allows molecular biology researchers to create simple animations (e.g. spin or morph) to illustrate their work. 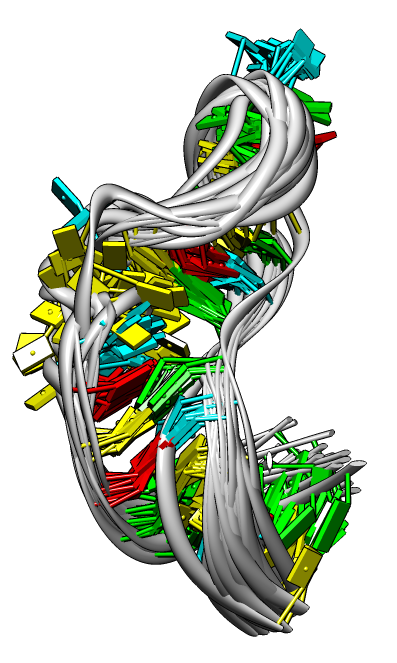 Six people in our lab work directly on developing the Chimera molecular visualization software. Chimera's most distinguishing feature is its usability. This talk will consider how usable video is as a communication method for biologists for explaining results to other researchers. 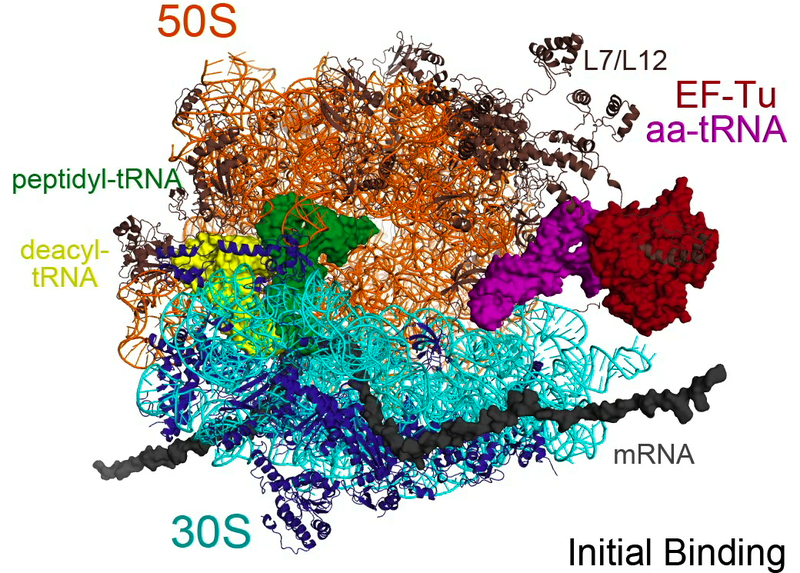 Yesterday's biology research talks: 1) transfer messenger RNA clearing stalled ribosomes, 2) chaperonin open and closed states, 3) phage T4 tail contraction. Good examples of how biologists talk to biologists and benefit from animations in their explanations. 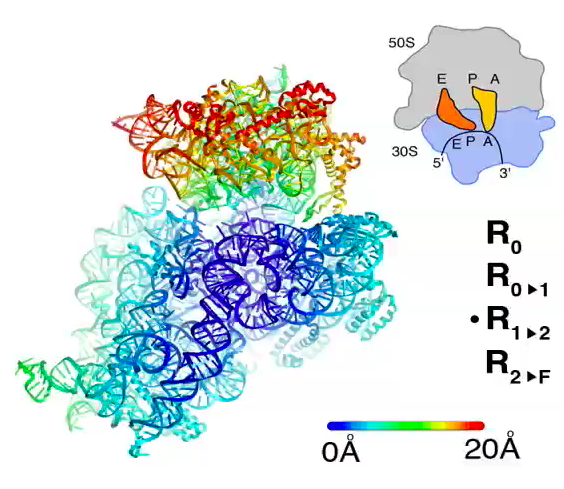 The use of animations was far above typical standards -- being presented at an "animation" workshop and coming from the top labs in the world in their research areas (Joachim Frank = ribosome EM, Wah Chiu = high res cryoEM, Michael Rossman = virus EM). 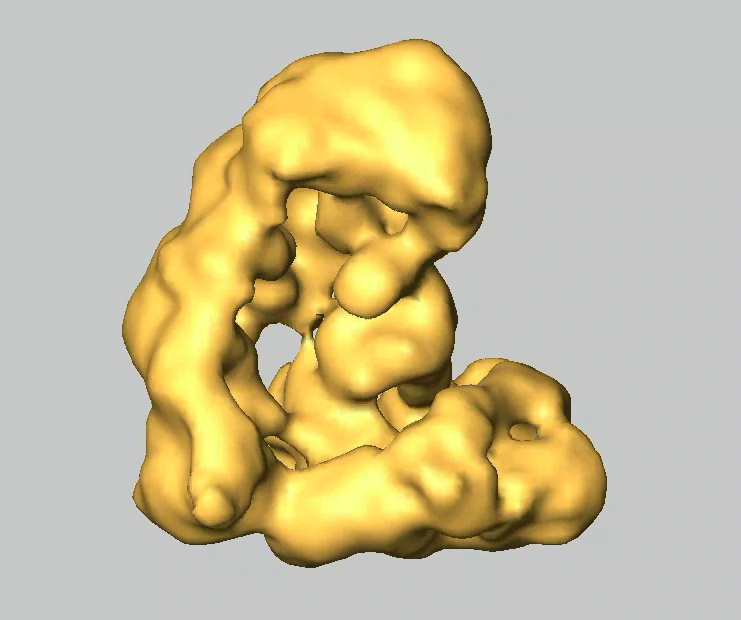 How can simple animations help communicate molecular and cellular structural biology research? 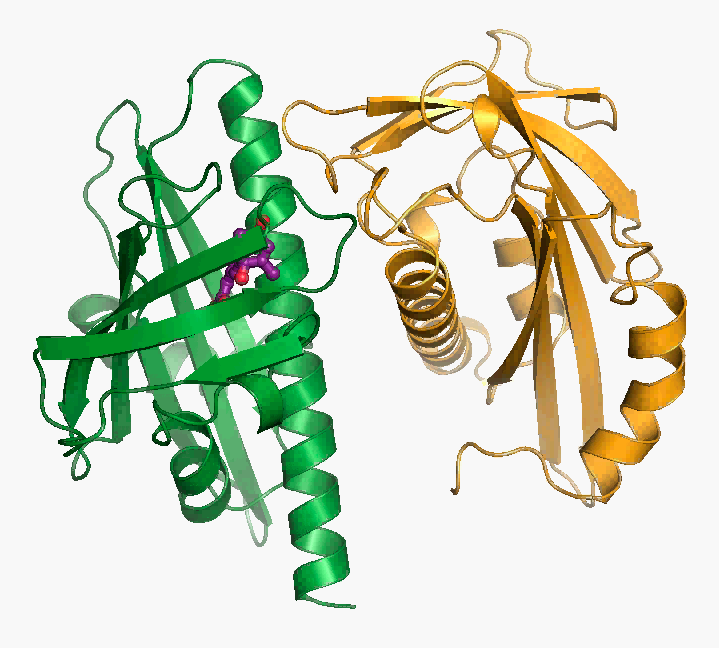 How are animations used in journal articles today? 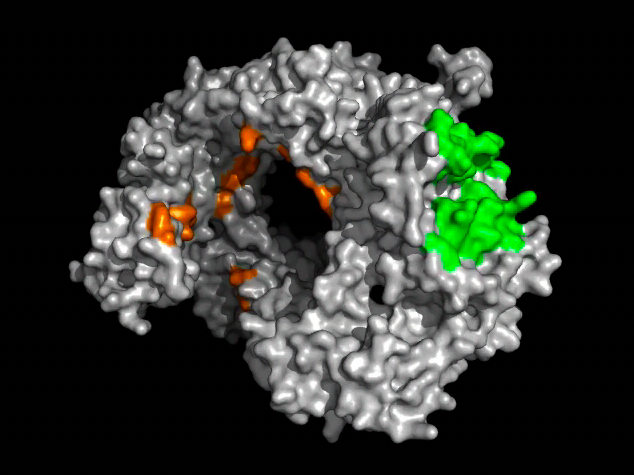 What are the difficulties for a biology researcher making and publishing simple animations? 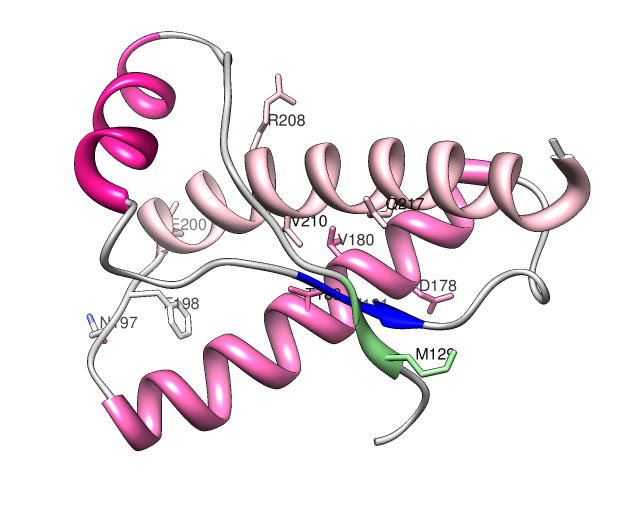 Figure 2E. Cross-eye stereo pair from journal article. 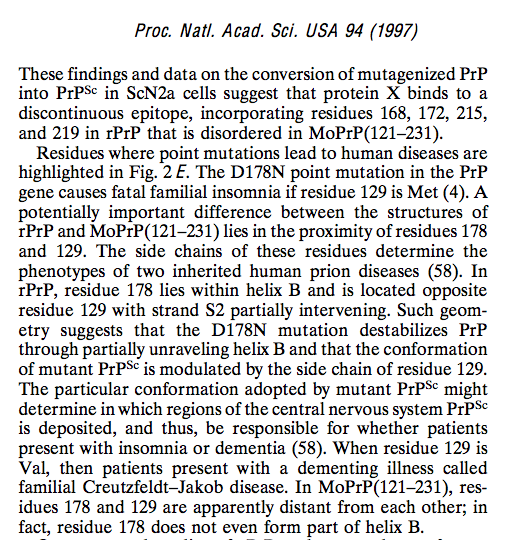 Text describes spatial relation between residues 129 and 178 in lower right corner and their implication for a fatal familial prion disorder. Animation. Which residue is in front D178 or M129? How far apart are they? 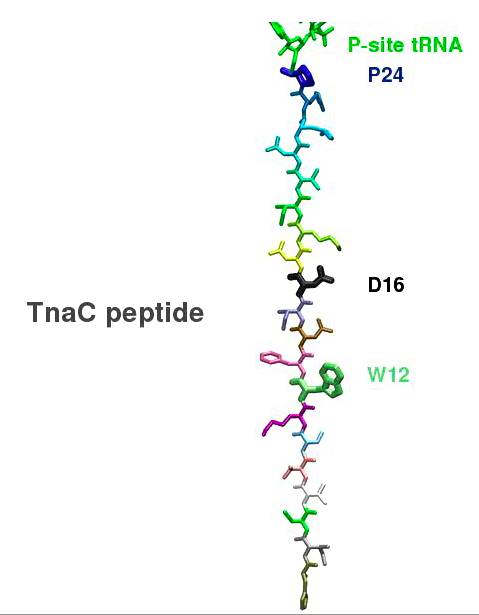 The blue strand separates these residues as is easily seen in the animation but hard to see in the figure. 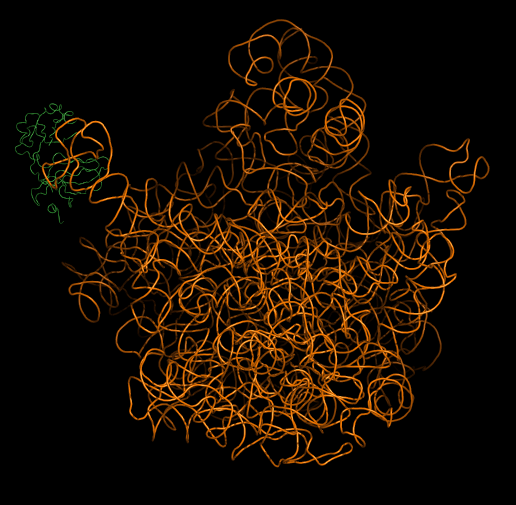 RNA hairpin, 20 NMR models. 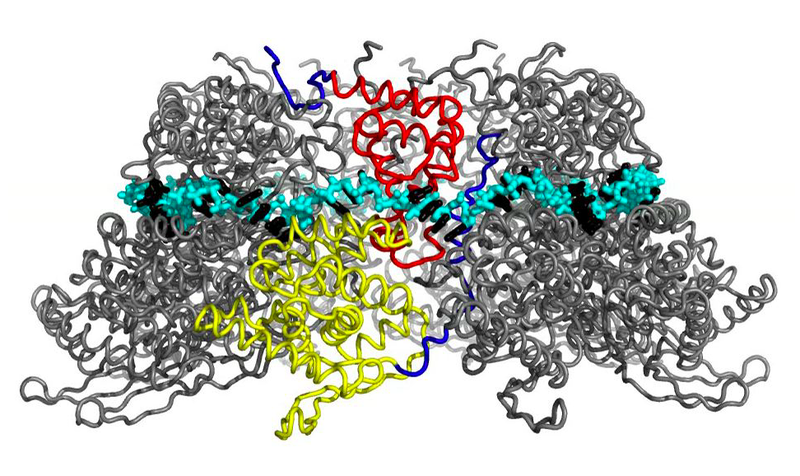 Superposed models are visually more complex. Animation is especially effective in these cases using morphing -- conveying the differences in time instead of in space. Spin or morph. yMorph done in Chimera using Kreb's and Gerstein morphing algorithm using the same used by the Yale morph server. 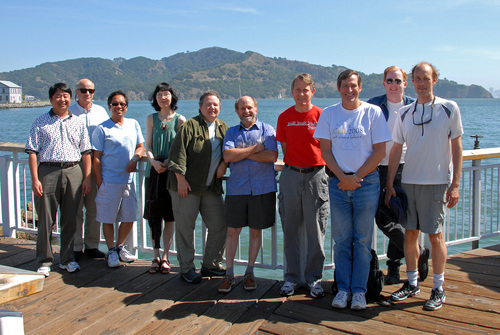 940 research articles in Science, Feb 2009 - Feb 2010. 91 articles include movies in supplementary material. 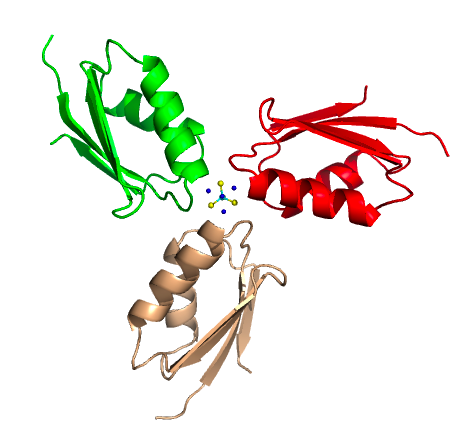 5% - 10% of molecular and cellular structure articles included animations. 17 articles on molecular and cellular structural biology in Science Feb 2009 - Feb 2010 that include movies in supplementary material are shown below. 15 of 17 articles use movies that are simple enough to make in Chimera. 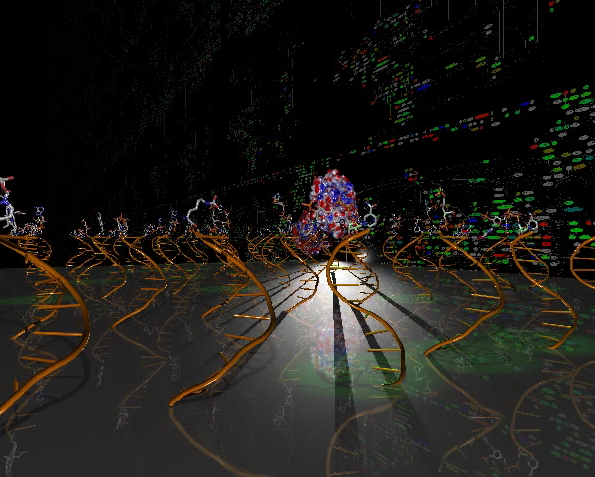 Other two are an animated 2-d diagram plus graph, and cinematography of a microarray. In most articles the apparent effort put into making animation was low, less than effort put into a typical journal article figure. Software is difficult to learn. Software is difficult to use even when you know how. Standard movie formats don't play on all computers (stock Mac, Windows and Linux systems). Journals don't embed movies in online articles, instead bury them in supplemental material. Animations don't replace figures -- it's just more work. Is it still common to print articles on paper for reading offline? Command scripts are used to create movies in Chimera. 90% of Chimera users don't know any of these commands. Average time to learn this spin movie command sequence from Chimera documentation: 1 hour (estimate). 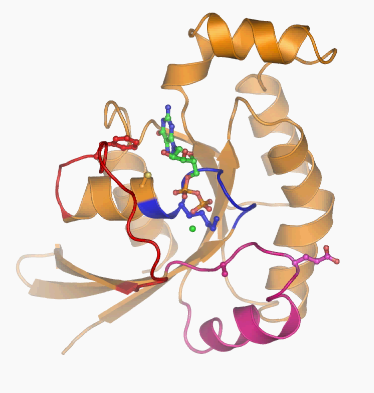 Maltotriose binding protein example Chimera movie script. 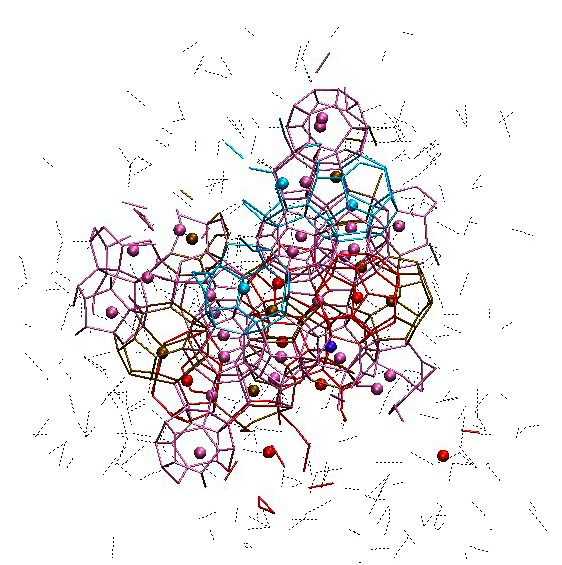 Morphing, ligand docking, labeling, hydrogen bonds, surface pocket, aromatic residues. 50 lines, 20 different commands. Making a Chimera animation script requires much more knowledge than knowing how to display the same steps through the graphical user interface. Press a button on the graphical user interface to make a standard movie. 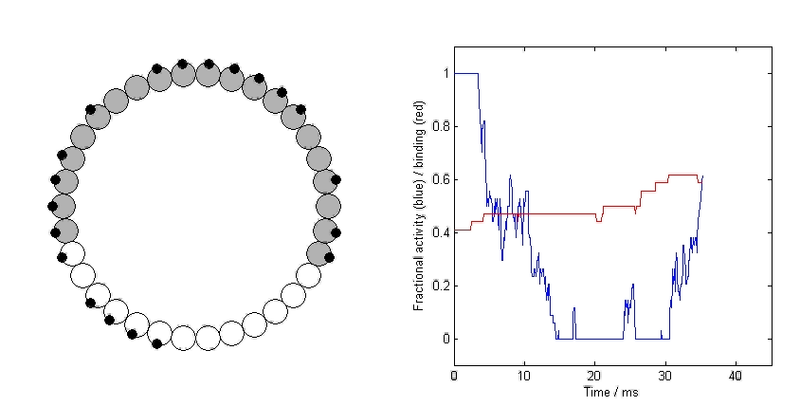 Chimera has this for morphing between molecular models and for playing molecular dynamics trajectories. 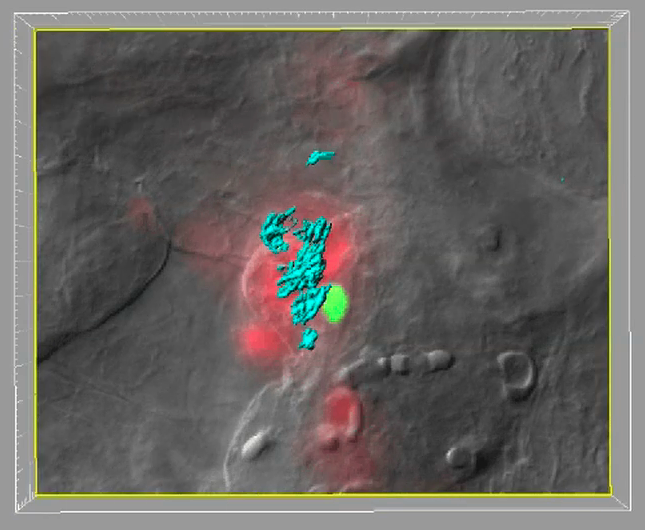 Next step: Should have this for other common movies: spinning models, slicing density maps. Limitation: Won't handle multi-part movies. 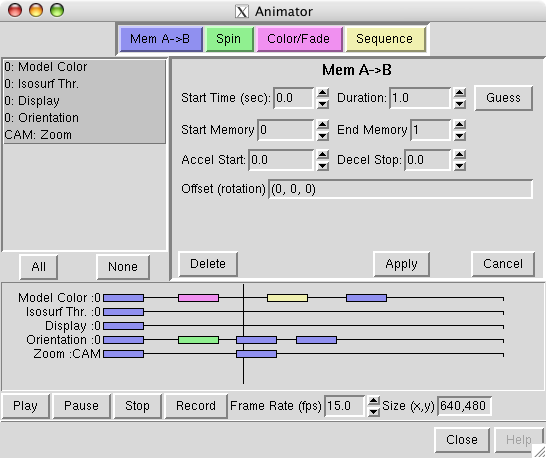 Steve Ludtke developed EMANimator Chimera animation extension. Provides a time-line graphical editor for making movies. Next steps: Need to support more transitions. User interface needs to be more self-explanatory and more fool-proof. Chimera could figure out the transitions between user-specified scenes. 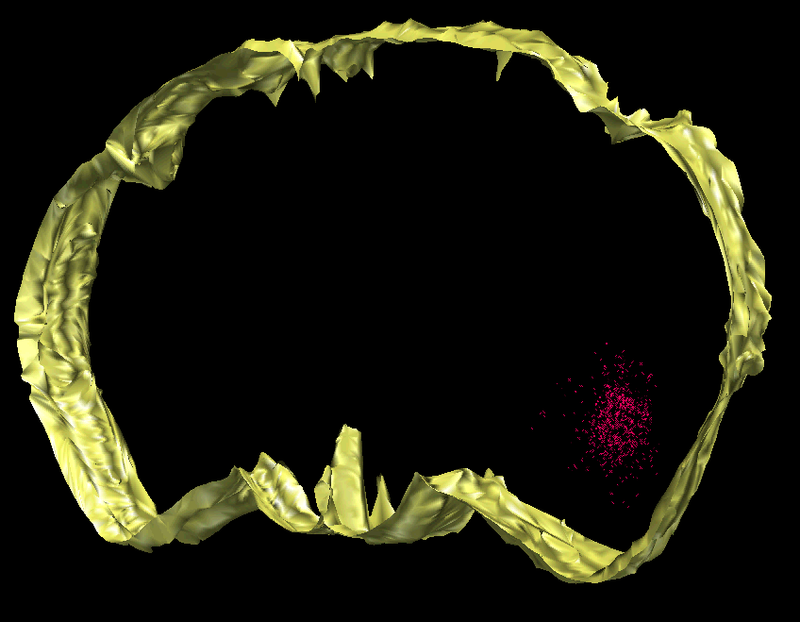 Chimera would interpolate between key-frames in natural ways (moving models, fading colors, fading models in and out). Don't need knowledge of commands. Allows composing alternate movies from saved key-frames. May be difficult to implement. 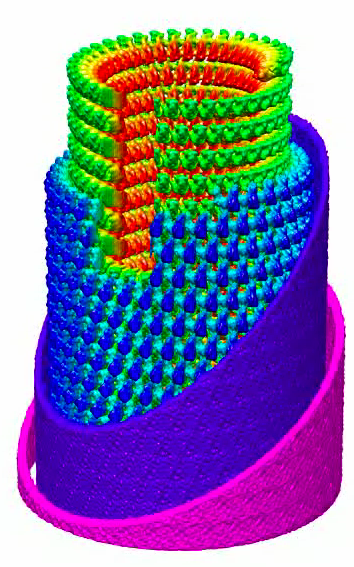 Additional parameters are needed for some interpolations. For example, spinning 360 degrees has the same starting and ending state. 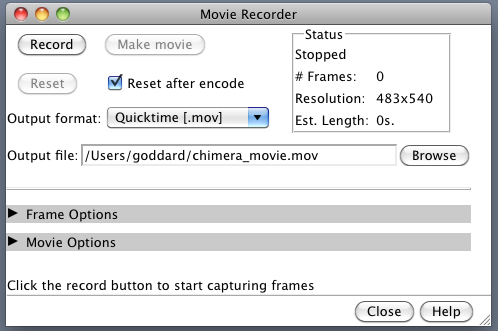 Movie Recorder tool in Chimera can directly capture all frames and create a movie. Can directly capture hand motion and any scene changes done with the graphical user interface or with commands. Produces jerky movies because motions done by hand are not smooth. If real-time rendering frame rate is slow, movie playback at 25 frames per second will make everything happen fast. Can't fine tune the result except by recapturing the whole sequence. One mistake ruins a whole sequence. Commercial screen capture software can directly capture anything done in Chimera. Example software: ScreenFlow (Mac) or Camtasia (Windows or Mac). Playback speed matches actual speed independent of graphics rendering rate. Easily add highlighting making a region bright to focus attention. Easily add zooming to focus attention. Produce output (e.g. Flash) formats that will embed in web pages. Produce movie encodings that will play on Mac, Windows and Linux. Does not come with Chimera. Costs from $100 - $300. Same limitations as built-in Chimera screen capture. In past years Chimera generated animations frequently would not play in PowerPoint. The animations would play in all other movie players. This is a PowerPoint problem that significantly impedes the wide-spread use of animations in research talks. Maybe this problem is fixed in newer PowerPoint versions? Document working parameters. What combinations of PowerPoint version, video format, movie width and height, bit rate (quality setting), system graphics acceleration settings, graphics card and any other relevant parameters that produce correct playback. Make this documentation easy to find. Have Chimera movie encoding offer a "PowerPoint compatible" option. The capriciousness of PowerPoint may be impossible to characterize. There are companies (e.g. PlaysForCertain) that do nothing except make your movies play in PowerPoint. Are there video formats that will play on the major operating systems (Mac, Windows, Linux) without requiring special software? I gave up surveying movies in Nature after the some movies would not play on Mac OS 10.6 with extra codecs provided by Perian. Do Quicktime movies play on a stock Windows 7 system? How will a biology researcher embed videos on their lab web site to be played in a web browser on Mac, Windows, Linux? Movies embedded in this talk web page will display correctly on Mac but not on stock Windows or Linux systems. Uses QuickTime html embed. Issues that publishers of journals face to embed movies in the main body of article text (so the movies can be played while text is shown). What cross-platform (Windows, Mac, Linux) embedded movie player to use. Other web sites (YouTube, et al) have solutions. Can movies be embedded in PDF format articles? Current movies in supplementary material are of such poor quality does it currently justify the expense of developing infrastructure to embed movies in articles? Do some journals already provide embedded movies in article text?